Mark your calendars. 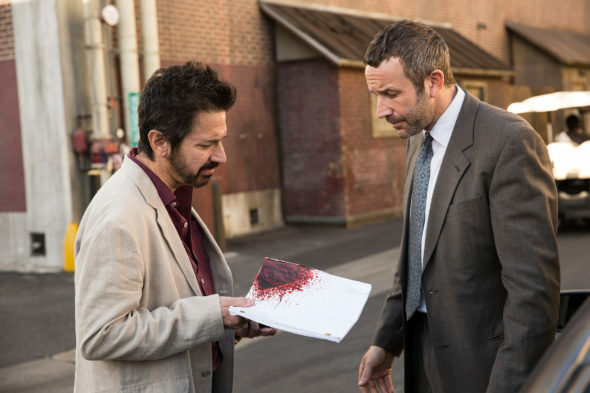 Today, EPIX released new photos and the premiere date for their upcoming TV series Get Shorty. Based on the novel by Elmore Leonard, the drama centers on “Miles Daly, a hitman from Nevada who tries to become a movie producer in Hollywood as a means to leave his criminal past behind and win back his recently-estranged family.” The cast includes Chris O’Dowd, Ray Romano, Sean Bridgers, Lidia Porto, Megan Stevenson, Goya Robles, Lucy Walters, and Carolyn Dodd. 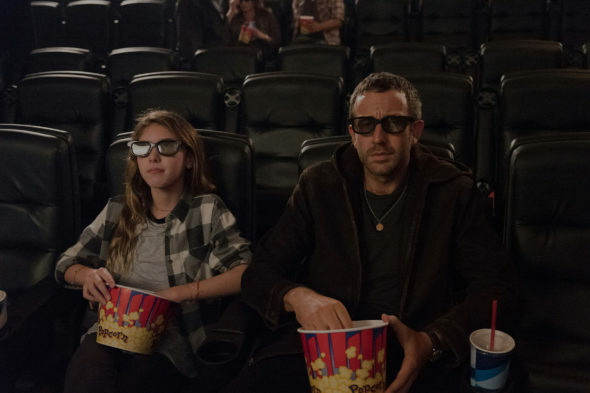 Get Shorty debuts on EPIX on August 13th at 10 p.m. ET/PT. NEW YORK – May 16, 2017 – Premium cable network EPIX® has set the premiere date for its original series Get Shorty. The 10-episode dark comedy from MGM Television, based in part on the 1990 best-selling novel of the same name by Elmore Leonard, will debut on EPIX Sunday, August 13 at 10:00PM ET/PT, 9:00PM CT. The cast, led by Screen Actors Guild Award® and BAFTA TV Award nominee Chris O’Dowd (“Miss Peregrine’s Home for Peculiar Children,” Sapphires, Bridesmaids) and multiple Emmy® winner Ray Romano (“Everybody Loves Raymond,” “Men of a Certain Age,” “Parenthood”), includes Sean Bridgers (“Rectify,” Room); Lidia Porto (Horrible Bosses 2); Megan Stevenson (“Review”); Goya Robles (11:55); Lucy Walters (“Power”) and Carolyn Dodd (The Adventures of Catty Wompus). O’Dowd plays Miles Daly, a hitman from Nevada who tries to become a movie producer in Hollywood as a means to leave his criminal past behind and win back his recently-estranged family. There, he meets Rick Moreweather (Romano), a washed up producer of low quality films who is desperately hanging on to the rungs of Hollywood relevancy and begrudgingly becomes Miles’ partner and guide through the maze of show business. Along with his criminal associate Louis (Bridgers), Miles attempts to keep his worlds from colliding as he balances the demands of filmmaking while keeping the suspicions of the crime ring’s chief – and production bankroll – Amara (Porto) and her dangerous nephew, Yago (Robles) at bay. Also involved in the production is ambitious studio executive April Adams (Stevenson), who started in the business as Rick’s assistant, as well as Miles’ beloved daughter Emma (Dodd) – despite objections from Miles’ estranged wife, Katie (Walters). Created for television by Davey Holmes (“Shameless,” “In Treatment,” “Damages”), Get Shorty is executive produced by Holmes and Emmy nominee Allen Coulter (The Sopranos,” “Damages”) who also directs the first episode. Adam Arkin (“The Americans,” “Billions”) directed three episodes of the series and is also a co-executive producer. The series is produced by MGM Television and internationally distributed by MGM. Get Shorty is the third original series premiere for EPIX, joining its timely, critically-acclaimed drama Berlin Station and comedy Graves (which garnered a Golden Globe nomination for star Nick Nolte). Both series are slated to return for second seasons in 2017. Metro-Goldwyn-Mayer (“MGM”) announced last week that it closed a deal to acquire full ownership of EPIX, having reached an agreement to acquire the interests held by joint venture partners Viacom, Paramount and Lionsgate. What do you think? Are you a fan of the book or movie Get Shorty? Will you watch the EPIX TV series?